The Museum enjoyed a good turnout for the workday scheduled for April 2nd. The weather wasn't particularly inviting, but did eventually clear up with bright sunshine and mildly hot temperatures. There was a broad variety of projects worked on during the day. There has been some controversy about what prop to try on the Canuck. The Museum has an original Canuck prop in inventory, needing just a light refurbishment and it has been decided to try the prop on the airplane. Roger doesn't recall this prop flying the airplane all that well, but those flights did take place before the engine was overhauled. Kurt Maurer was recruited to delicately sand the finish on the wood portions of the prop and re-varnish it. Kurt managed to apply two coats of varnish to the prop on Saturday. One of the main tasks for the day was to complete the annual inspection on the Great Lakes and the Piper Cub. The team elected to start with the Great Lakes because it should be in very good shape due to all the work that Roger poured into it in 2009 and 2010. Figured we'd be through by lunchtime! It actually took all day. John Goble is a thorough and conscientious inspector and the airplane isn't the easiest to get opened up for inspection. A few minor items were found to need correction, but all the work was completed by the end of the day and the aircraft was started and taxied a bit before being put back into the hangar. A couple of guys did look at the Cub's brakes and John did give it a cursory look-over for real obvious issues. He'll be reporting to Steve Freeman his findings, if any. The Cub may well get its annual inspection on Saturday, April 16th. Progress continued on the Fokker Dr.I Triplane. Art Caballeros has continued reassembling the airplane, so Saturday we found an airframe with all three wings and tail surfaces attached! Art showed up to paint the “N” numbers on the tail and completed that task before lunch. Kevin Monahan and Art Wilson worked on the rotary engine, effecting repairs to a few of the valve train bearings and by the end of the day had everything repaired and hooked back up. Progress was made on the Thomas-Morse as well. At some point during the day Kevin finished varnishing the fuselage and painting fittings on T-1. We'll need to do a thorough inspection to ensure everything is done… with that many nooks and crannies we are bound to have overlooked something! Tom Gaylord continued cleaning up cockpit and engine furnishings for reinstallation, and Dave Miller did some refurbishing work on the T-1 rudder bar. 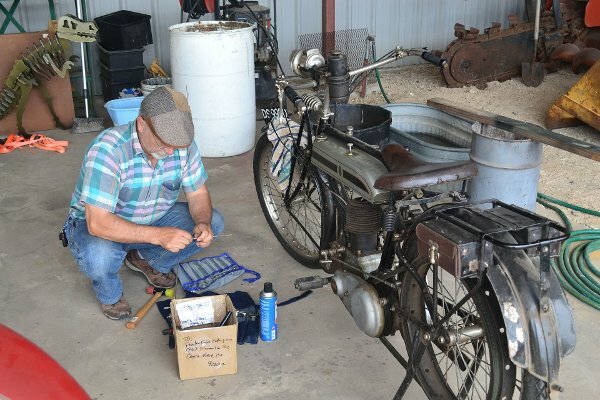 Duncan Charlton spent his day working to get the 1921 Triumph motorcycle running satisfactorily. There have been issues with the brakes and various other controls, so Duncan was trying to fix those squawks! The bike actually spent a moderate amount of time being ridden around the property and while Duncan was successful in some repairs others are not quite ready for prime time yet! David and Ian Whitaker spent much of their day working on the Dormoy Bathtub. Modifications were made to the tail wheel and its mount and the parts refinished. Various brackets were fabricated and the vertical fin cover was glued on. The airplane is starting to look like an airplane again! 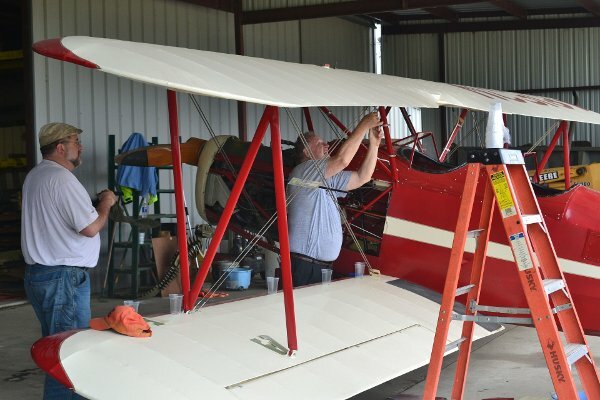 Terry Bledsoe spent his day working around the grounds storing things, throwing out trash and preparing the place for grooming later in the month in preparation for the Fly-In on May 7th. Overall the property is looking better and better thanks to Terry's considerable efforts! Cameron Whitaker spent his day working on vehicles, mostly the Model T Ambulance as I understand it. He has made some changes to the distributor and the vehicle has continued its progression on working smoothly. John van den Eynde did a lot of work to prep the vehicle - getting the radiator cleaned out and refinished and installed. He also repainted the topsides on the other Model T ambulance and made a series of minor mechanical and cosmetic repairs around the vehicle. It does look much better than before, though we still need to address some bottom side issues… the differential still has some sort of minor leak, is dirty, and needs refinishing.